The Community — Camera Ready Kutz, Inc.
Every month we raise funds for individuals with various needs...Top Surgery, Help with Rent, Business Idea, to Pay a Bill, Artistic Project, Help with Kids, a Hobbie, etc. Our goal is to raise a minimum of $500 per month and to achieve this we need your continuous help. You can donate at the shop during your appointment or right here on the site by clicking the "Donate Today" button below. We chose to collect for individuals instead of organizations because we want to make a DIRECT difference. We also know that sometimes you just need a break...a hand...a windfall...a little cash to get you over a hump without having to pay it back. You can nominate yourself or someone else for one of our monthly givings below. * For the months of November & December our goal is to raise $800 to buy 210 Hygiene Kits to give away this Holiday Season to Men & Women in shelters around Brooklyn. You can DONATE here or on FaceBook. The Hygiene Kits include: Washcloth, comb, toothpaste, toothbrush, razor, shave cream, deoderant, soap, toothbrush cap & shampoo. * We are also collecting wrapped under garments & toiletries to create our own Hygiene Kits to go along with the ones we will buy. PLEASE bring by any amounts of various male &/or female toiletries & wrapped under garments to the shop any time and day. If you would like to be a recipient or would like to recommend someone to receive one of our Monthly Givings contact us today with the name, description of need, email address and or phone number of the possible recipient. "Shape Up: Gay in the Black Barbershop" is a short documentary directed by Derrick L. MIddleton. Set in Harlem the film sheds light on the sacred space the barbershop holds within the black community and the complex relationship that black gay men have with this space. We raised money to help Derrick further this project. He has plans to expand on this documentary and create a new short about the plight of Gay Women in the Black Barbershop. We had our First Annual Back Bag Giveaway. 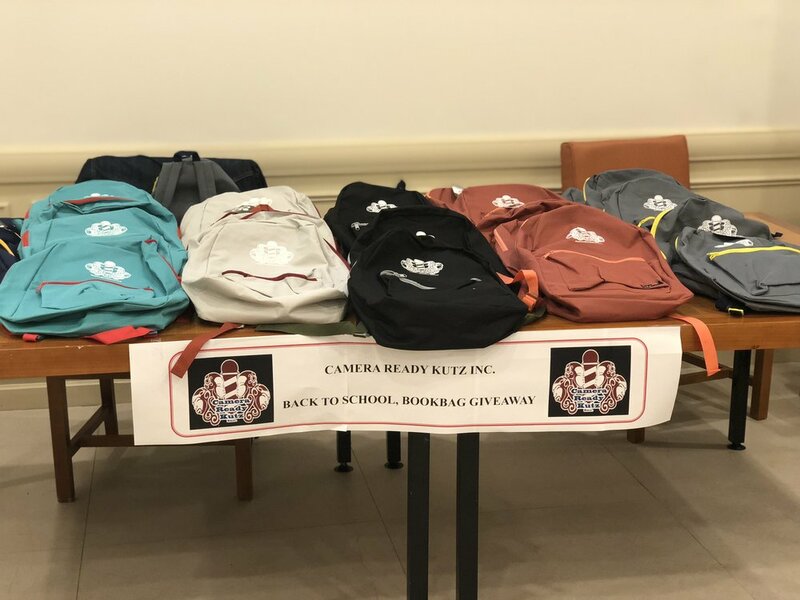 With your help we were able to collect a little over $1,000 to buy 100 backpacks filled with school supplies to give away to children living in shelters around Brooklyn. A client lost special hearing aids that are not covered by insurance. We raised $400 so he could get a new pair. * For the months of November & December we collected wrapped under garments & toiletries to create our own Hygiene Kits which we gave to various shelters around Brooklyn.